NEC is considered to be one of the most successful brands in Japan. Handsets of this manufacturer are very popular in this country. Let’s think together whether Nec 21i is a rival to phones from Korean manufacturers. FIRST OVERVIEW. My test sample of Nec 21i was delivered from Germany. It is a typical Japanese clamshell phone, which supports I-mode, GSM 900/1800 and GPRS. A standard delivery kit includes a phone, a charger and two user’s guides (in English and German). You can estimate phone design even without unpacking it. The box is transparent and the phone is opened in it. Europeans have already got used to more compact phones (Motorola V50, Samsung A800) and Nec 21i seems rather large to most of them. The phone dimensions are 105х44х25mm and the weight is 120 grams. The handset has a comfortable keypad and a large display, which is capable to support up to 256 colors (120x120 pixels). It is not very unusual today, some manufacturers have phones which are equipped with 120K displays. But don’t forget that Nec N21i is a phone, which was announced in 2001. In my opinion, color balance of this display is worse than in Ericsson T68. Colors are seemed to be dark. Even if you change a contrast, you won’t see a viid picture on the screen. NEC 21i doesn’t have an external display, as most of other Korean clamshell handsets. LED, which has a rhomb shape, is used instead of this outward display. It is lighted while incoming call by a special color (green apple, pumpkin, apple, grape, pearl, blue sky or blue Hawaii). Letter “I”, which is drawn on the indicator highlighted a phone possibility to support I-mode. On the rear part of the phone you’ll see a special place for SIM-card. The holder is very reliable; SIM-card is fixed by the battery. As for me, it was very easy to insert a SIM-card but very difficult to remove it. The construction is not well-weighed. The phone fast registers in the network, but, first, it connects to GPRS and only after that to GSM-network. Twelve keys, 4-directional joystick and 2 functional keys are used for the menu navigation and phone control. FUNCTIONS. 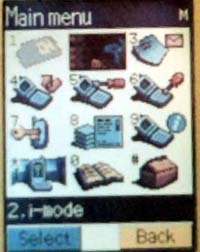 Phone menu, which is consists of 12 menu items (12 animated icons in the main menu) is called by a special key. Twelve animated icons are displayed simultaneously in the main menu. Below you can see a list of them. To access these items, press a menu key and then a respective key. Alphanumerical keys can be also used for quick dialing of the numbers from the phonebook. First functional key is responsible for the access to the phonebooks (1 pressure – phone memory; 2 pressures – SIM-card; 3 pressures – fixed phone numbers). Long pressure on the left functional key activates voice dialing, short pressure opens an access to voice memo function. If you press this key several time during the talk, you can make several records (15 seconds each). Navigation key is also multifunctional. To enter profiles menu, press it up, to get access to the list of outgoing/incoming calls, press right/left arrows respectively. If you like to adjust a volume of the loudspeaker, press this key down. There are two more keys placed under the display. Left key provides access to I-mail, right key connects you to I-mode. You can’t change these keys. “C” is necessary to cancel an action. There are also standard send and reject keys. The latter key is also can be used to exit a menu item, it returns you to the standby mode. Phonebook. This phone has the best phonebook I’ve ever seen. You can add several phones (home, mobile, office), data, fax, 2 e-mails and 2 notes to each entry. Besides, you have 2 more free fields. Phone numbers can be sorted in groups. Up to 10 voice tags, 7 colors of LED can be assigned to each entry. There is also a possibility to add a photo and an own melody to 20 contacts. The phone can be synchronized with Outlook. None of the phones, which are officially shipped in Russia, have such capabilities of personalization. Unfortunately, you can’t copy phone numbers from SIM-card memory to phone memory and vice a versa. Messages. All settings are features are standard in this menu. Pictures and melodies can be included in the message. Screen setting. Different display settings for different modes are hidden here. When you switch on the phone, you can create a greeting message and select an animated greeting picture. It’s possible to select one of 2 pre-default pictures (rather boring ones) or download up to 3 ones from the special site. There are 8 color themes to change colors of the menu. Among all of them I preferred white scheme. The information is the most visible at this background. Display contrast can be adjusted here too. Time and date can be shown on the display in the standby mode. There is a world time function and alarm-clock, which alerts once, and works even when the phone is switched off. Phone settings. It is possible to activate one of pre-installed profiles (Normal, Meeting, Pocket, Car) here. All of them are adjustable. You can set keypad tone, select a desired tingtone, volume level of the ringer, switch on/off vibrating alert, SMS-tone and e-mail tone, turn on/off a backlighting and auto answering function. Few words about ringing tones. The phone supports 16-tones polyphony, but it is not comparable to the phones, which are available on our market. All melodies are much louder than those, which I heard on the Korean phones. They are really impressive. Other settings are standard for vast majority of the phones: language selection, anykey answer, call waiting and etc. PIN, PIN 2 and pone lock can be set in such item as Security. Call list enables to view lists of incoming, outgoing and missed calls. Hateful phone numbers can be added to ignore list. Network. Not only network settings, but GPRS as well can be activated here. Unfortunately, I couldn’t test this feature, as I had European settings in my phone, which were not suitable for Russia. It was impossible to change them. E-mail client operates via I-mode too. Accessory. It is the last but not the least menu item. Calculator enables to perform basic operations and operations with brackets. You could also store intermediate results in the memory. Currency converter is also available. There are weekly and monthly views of the calendar. Sound reminders can be set for events. Dictaphone enables to record not only notes, but short phone talking too. Besides, there are 2 pre-installed games for entertainment. First one is maze. Your mission in the second one is to sort falling color boxes in respective trunks. I was impressed by the personalizing capabilities of this phone. None of the European or Korean phones have such capabilities. Ringing tones size and quality are comparable only with Panasonic GD87. Among shortcomings I noticed a bad compatibility of the phone with Gem Plus SIM-cards. The peculiarity is that you can make a phone call, but nobody can reach you. If you use the other SIM-card, there are no problems with reception quality. Other shortcomings of NEC21i are the following: short autonomy (only 1 day in case of not active talking). If you play games, the battery will become low in a half-day. You can purchase data cable and car charger as additional accessories. Paying 300 USD for this phone, you’ll receive an exclusive advanced handset with a color display and excellent polyphony. It is much more functional than any of Korean handsets. But don’t forget about short operating time. Think, what is more important for you before buying this phone.